Posted by hslu in Congress, Election, Global Affair, Islam, Japan, Life, Death and Yuanfen, Middle East. 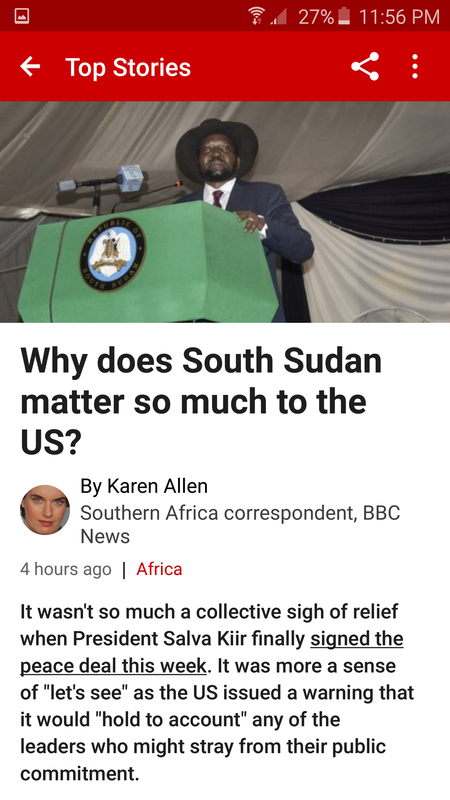 What are the real reasons behind the United State’s involvment in the domestic politics of S. Sudan? Is CIA working behind closed doors to over turn the current S. Sudan government because Obama wasn’t impressed by the current leadership? Or was it because the current government didn’t give a damn about what America wants? Is the U.S. doing the necessary background work to ‘build a nation’ in the African continent? Is Obama starting another front to divert world’s attention away from his ‘doomed from the start’ Iran nuclear policy? Is Obama tired of people calling him out on his failed Middle East foreign policy?’ Is Obama picking on S. Sudan because it, unlike ISIS, is an easy target to deal with? The American peoole have absolutely no say on how America’s president conducts his foreign policy. Countries such as China, Japan, Korea, Vietnam, Phillippine, Iran, Afghanistan, Iraq, Israel and a few others in central America have suffered from America’s involvement in the past. The negative impact on these countries have been deep and painful. American people also suffer through high national debt, death to thousands of Amirucan soldiers and direct attackS big and small on American soil. When will American people wake up and make U.S. presidents, past and present, accountable for his decisions and actions in the office? While we are at it, let’s lump the Senators and Congressmen and congress women accountable for their votes in the office? This is simply not fair. The status quote must be changed. Is S. Sudan the first in the African continent? Yeah, no. 1 in traffic congestion in the entire U.S. of A. How is that for beating L.A. and San Fran to claim the dubious honor? I have never like to drive in D.C. and bad traffic is on top of the list. Cops everywhere is the next. They will give you a ticket for any traffic violation on the book. The capital city depends on this revenue to get by. 10. Out of state cars drop tourists off then move slowly looking for free parking spots on the street. 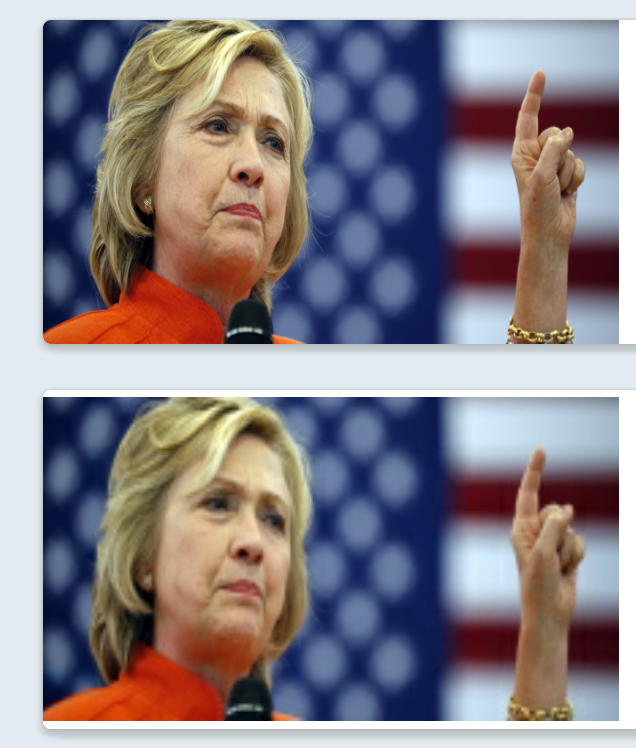 Posted by hslu in Global Affair, Islam, Middle East, Military, Muslim, Obama, Religion. A few years later, American people will wake up to the fact that Obama allowed Iran’s Revolutionary Guard to investigate Iran’s compliance with the nuclear deal he engineered as the over riding factor which will make Iran a country with nuclear weapons. This was one of the four secret deals that Obama and Kerry didn’t tell American people about when the deal was signed. It was the reason Iran agreed to the deal because America will never find out the truth. When it does, which will not take 15 years, it will be too late. Yes, the path for military confrontation has been set. The seeds for a war has been planted. Israel will carry out the targeted attack unilaterally. America will have no option but to join the fight because Iran has vowed repeatedly to wipe Israel from the world map and defeat the worst infidel in the world, the United States. Yet, Obama chose to talk to Iran and appeased the country with a deal Iran couldn’t refuse. He and other democrats called it diplomacy but it was acturally selling American people short and handed America to Iran on a siliver plate. Americans are naive and complacent. This time it will be no different. But the negative consequence of Obama’s action will be incalculable. It will definitely accelerate America’s downfall. Posted by hslu in Computer. It used to be Paolo’s which occupied this prime location (next to the Fountain) in Reston Town Center for many years. 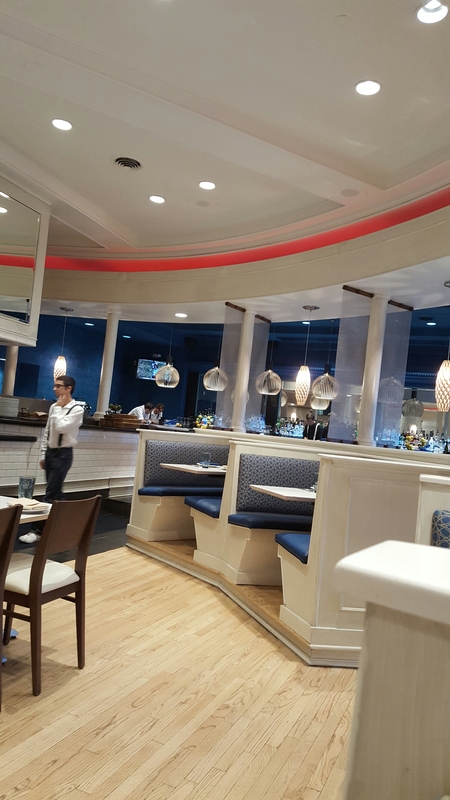 We’ve been to Paolo’s once but wasn’t very impressed by its food even though the ambiance and service were great. 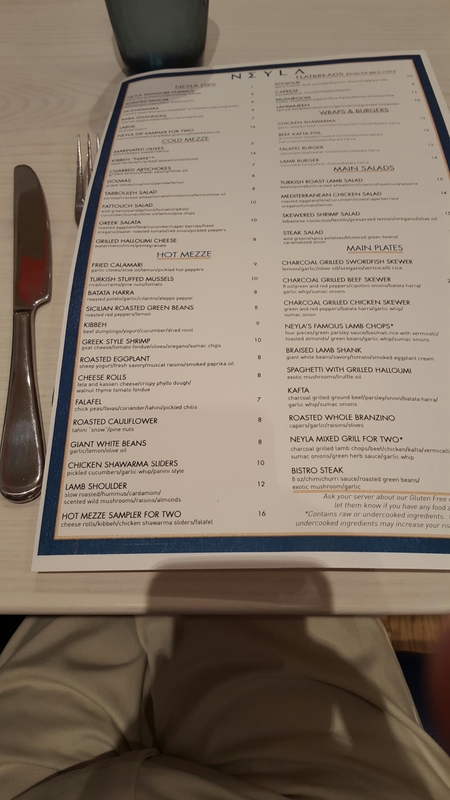 We came to Reston Town Center earlier this summer and noticed the change of ownership at this location to Neyla which was a surprise to us. The town center was always crowded with people when we visited here. New office and appartment buildings and new restaurants were added on a robust pace. Additionally, the restaurants here seemed to do great business at all times. However, there were some notable failures such as Uno’s, Paolo’s and Macaroni Grill. I guess that high rent in this popular place, change of consumers’ taste, increasing food cost and failed business model forced the owners to shut their operations. 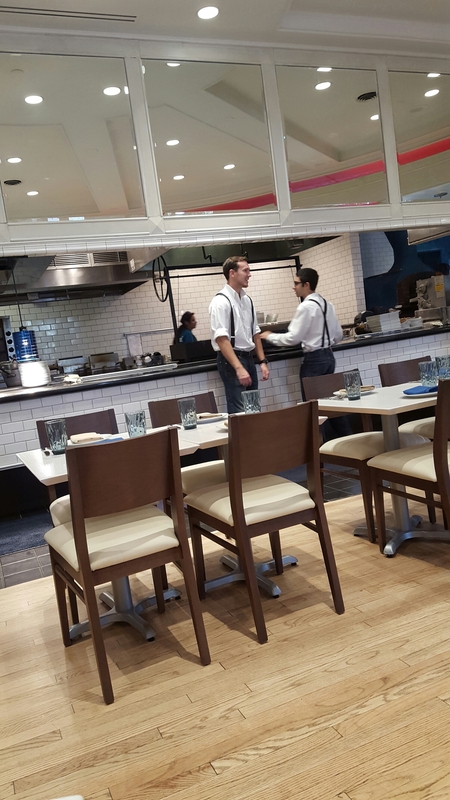 We came back to Reston TC mid-August and had a pleasant lunch at Neyla. The service was efficient. Our waiter was very helpful. The host was courteous. The owner (I assumed he’s the owner) stopped by and chat. The food we ordered had heavy Mediterranean influence: olive oil, lemon juice, vegetables, herbs, bread and seafood. 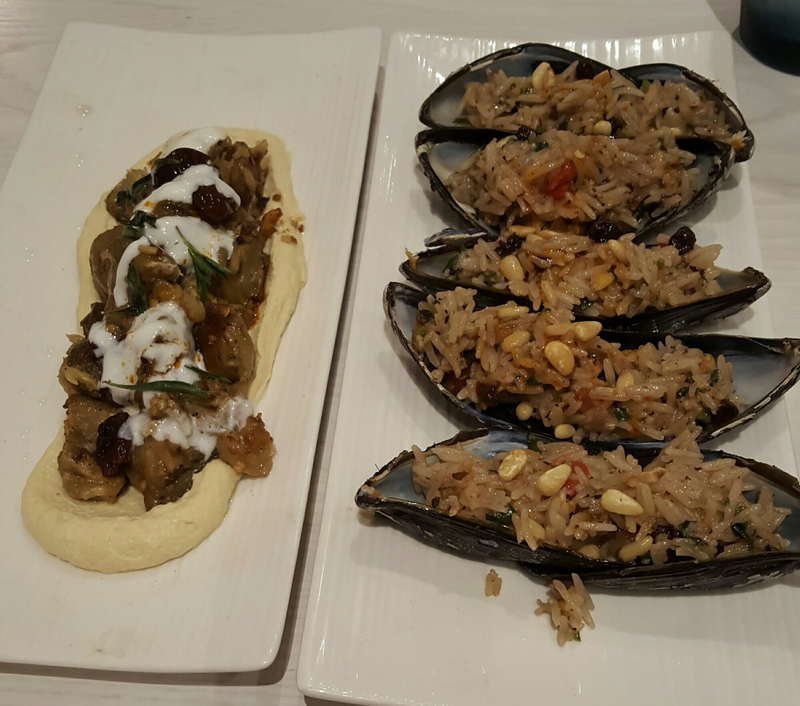 stuffed mussels with rice, currants, pine nuts and tomato. 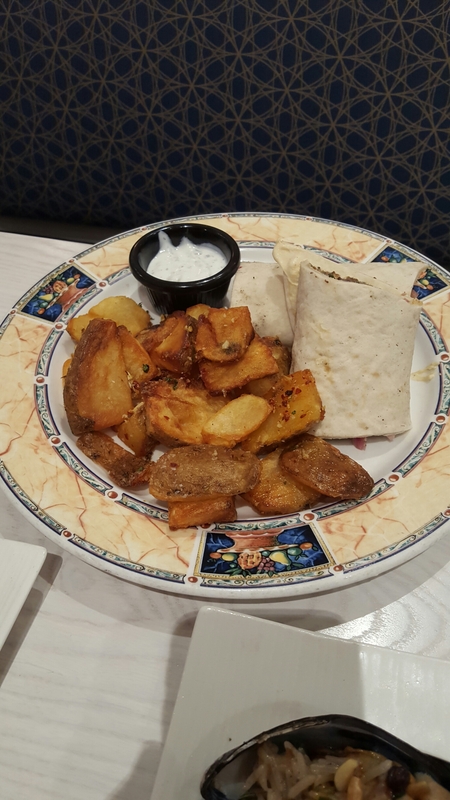 We also shared a pita wrap with heavily seasoned beef, roasted tomato, parsley and red onion. The Sauvignon Blanc from Chili was a bit on the high side but the wine was fruity, crispy and refreshing. All in all, it was delightful and we will be back to try more dishes soon. Posted by hslu in Taiwan. Posted by hslu in Japan, Social Issues, Taipei, Taiwan. I talked about America is sinking fast economically and in many key areas such as education and infrastructure. It turns out that some part of America is sink lietrally. Fresno California has been a paradise for immigrants, legal and illegal alike, and well-paid people working for high tech companies. Well, Fresno is sinking fast. 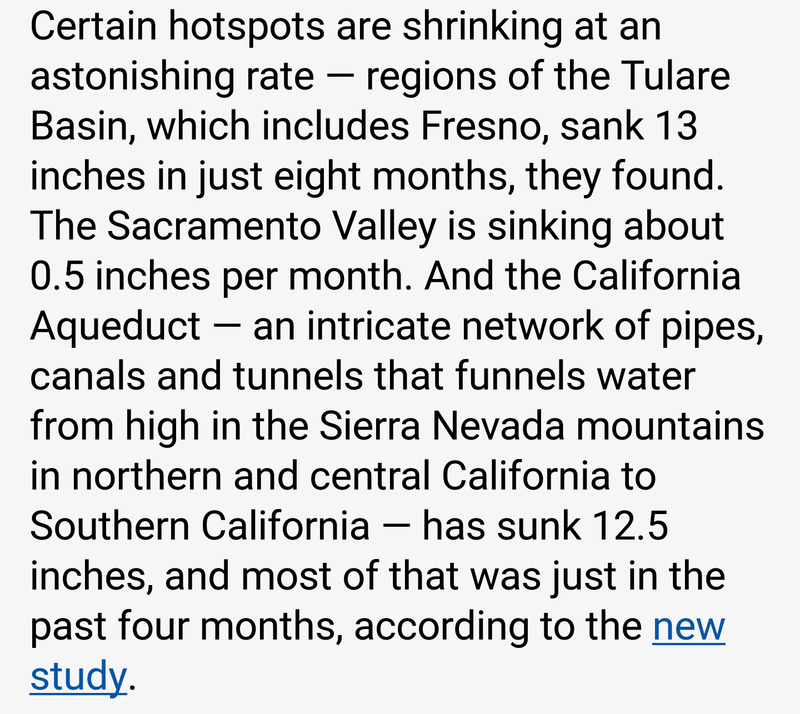 So, if you move to Fresno, watch out what’s happening down below. Don’t buy a house in Fresno because it will soon crack open as it sinks. Farmers are suffering now. They can’t make enough money to pay for water. The citizens are facing water restrictions because there isn’t enough water to go around the blocks. Oil companies which use water for thermal recovery may soon find water cost too high to continue operations in central valley region. Will the high tech companies be next in a few years because people may not want to live in California any more? The time has come. Google and Yahoo’s San Fran buses will have fewer riders if NASDAQ continues its downward spiral in coming weeks and months. Did Bill tell you to say that? 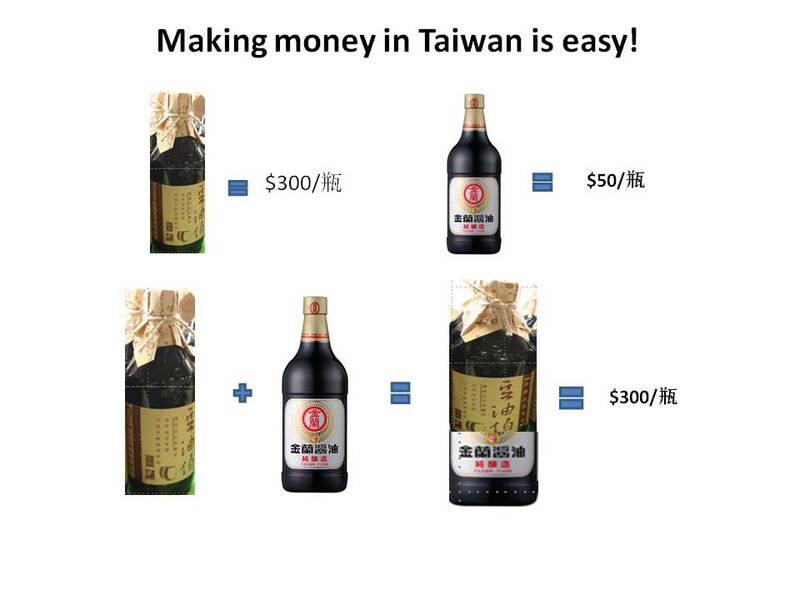 Posted by hslu in Economics, Taiwan.